The AK-47 assault rifle - one of the world's most iconic weapons - was created for patriotic reasons, says its designer Mikhail Kalashnikov. But he laments the fact it has become the weapon of choice for many of the world's guerrilla armies. Mr Kalashnikov was born to a poor peasant family in Russia's southern Altai region in 1919. A self-taught inventor, his talent for design soon found an outlet when, at the age of 19, he was drafted into the army to serve in World War II. Attached to a tank division, his first major design was a device that counted the number of shells fired by the tank's machine gun. Can I be blamed that they consider it the most reliable weapon? But it was in 1941, while recovering in a war hospital from wounds and shell shock, that Mr Kalashnikov - thinking about the Soviet forces' lack of an automatic weapon - came up with the idea of a sub-machine gun. Over the next few years, he worked on several designs that eventually led to, in 1947, the Avtomat Kalashnikova model - better known as the AK-47. Two years later, the gun was operational in the Soviet Red Army. Today, as many as 100 million AK-47s are thought to be in circulation globally, and it remains the world's most popular assault weapon. The reason for its success lies in its simple design - easily mass produced by unskilled workers, while providing utter reliability in the battlefield. But while the 86-year-old Mr Kalashnikov, a retired general, is uncomfortable at his weapon's use in so many bloody conflicts, he exonerates himself from any blame. "Whenever I look at TV and I see the weapon I invented to defend my motherland in the hands of these bin Ladens, I ask myself the same question: How did it get into their hands?" he told Reuters news agency. "I didn't put it in the hands of bandits and terrorists, and it's not my fault that it has mushroomed uncontrollably across the globe. "Can I be blamed that they consider it the most reliable weapon?" 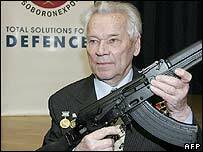 Mikhail Kalashnikov has lived and worked in the town of Izhevsk, Udmurtia - where the guns are still made - with his wife and children since 1949. In recent years he has attempted to diversify the Kalashnikov brand - most famously with Kalashnikov vodka in 2004. Coming soon - the Kalashnikov brolly?